*The vast majority of Beta Alanine users report a slight tingling sensation after ingestion. If you don’t feel the ‘tingles’, don’t worry, the product is still hard at work to maximize your workout. Non-Medicinal Ingredients: Acesulfame Potassium, Calcium Silicate, Citric Acid, FD&C Yellow #5 and FD&C Blue #1, Calcium α-Hydroxyisocaproic Acid (HICA), Natural and Artificial Flavors, Sodium Chloride, Silicon dioxide, Sucralose. Directions: Mix one to two scoops of Cellucor COR-Performance β-BCAA™ in at least 8 oz. of cold water or other beverage of choice daily. Maximum Performance Tips: Cellucor COR-Performance β-BCAA™ can be taken any time before, during, or immediately following intense training. 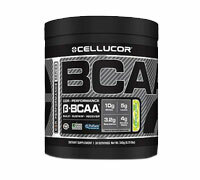 Cellucor COR-Performance β-BCAA™ may be mixed with any amount of water depending on desired flavor concentration. For maximum results, stack Cellucor COR-Performance β-BCAA™ with Cellucor C4 Extreme and/or Cellucor COR-Performance Whey Protein.